Coenzyme Q-10 plays an important role in cells and is utilized in the normal process of energy production. Coenzyme Q-10 is a key nutrient that may help maintain a healthy heart. AllegroMedical.com presents The Sunmark Coenzyme Q-10 Dietary Supplement. 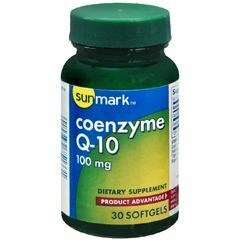 100 mg. Coenzyme Q-10 plays an important role in cells and is utilized in the normal process of energy production. Coenzyme Q-10 is a key nutrient that may help maintain a healthy heart. Not made with natural rubber latex. Packaged: 30 Per Bottle.